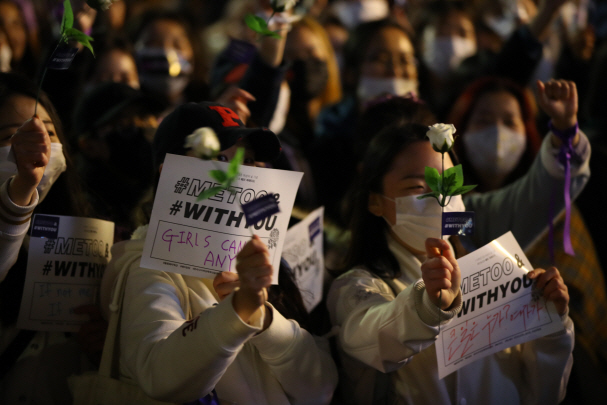 Over 40 percent of South Korean women in their 20s are surveyed to have deemed themselves as feminists, reflecting a social trend in which feminism is increasingly taking root among youngsters in a male-dominated Korean society, a women's think tank said Tuesday. The Korean Women's Development Institute conducted a phone survey of 1,015 people in their 20s on their awareness of pending gender equality issues in November. The poll had a margin of error of 3.1 percentage points and a 95 percent confidence level. On the ongoing "Me Too" campaign, 80.2 percent of female and 43.6 percent of male respondents expressed support. About sexual discrimination issues, 79.4 percent and 68.2 percent of the women and men said they are "interested" in them. On misogyny in society, 7 out of 10 females replied it's "serious," while only 3 out of 10 males gave such a response.